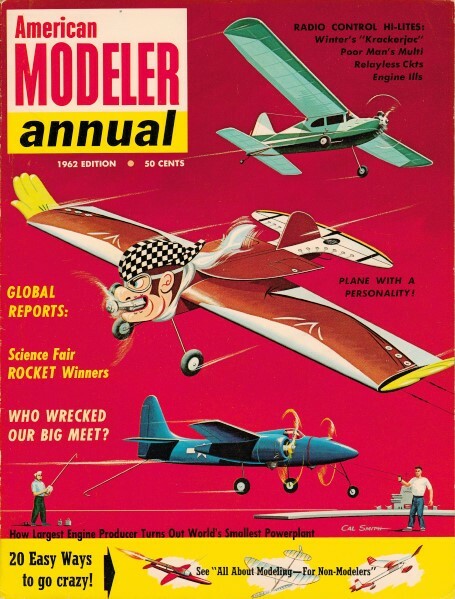 An extensive article introducing non-modelers to aircraft modeling appeared in the Annual Edition of the 1962 American Modeler magazine. 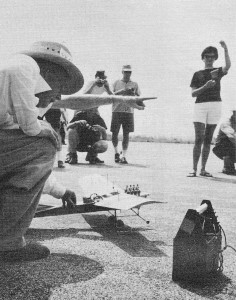 15 pages were devoted to describing just about every aspect of model building and flying - free flight gas and rubber; control line stunt, combat, scale, and speed; helicopters and ornithopters; indoor gliders, stick and tissue, and microfilm; even some early radio control. In order to keep page length here reasonable (because of all the images), the article is broken into a few pages. 20 Easy Ways to Go Crazy! Although paper-covered rubber powered plane looks like an indoor flyer, it won outdoor events at California meets! Pop-up tail, free-wheeling prop. Sixty-six-year-old expert built free-flight-gas copy of 53-year-old Antoinette monoplane. Control line team racers can be two types, left, international FAI class (with .15-size engine); right, AMA size with .29 power. WAKEFIELD, RUBBER-POWERED - The rubber-powered Unlimited and Wakefield (International Competition) designs are the grownup versions of our small ready-to-fly wind-up R.O.G.'s. In addition to the competition types there is quite a selection of Intermediate rubber-powered sport kit models available. These feature built-up construction, some are all sheet balsa, others have partial open-work structures and tissue covering. Sizes range from 15" R.O.G. 's to 30" span cabin types. There is a wide selection of rubber-powered flying scale models also with spans up to 3 ft. The rubber- powered contest types include: Wakefield, Unlimited hand-launched, unlimited R.O.W. (Rise-off-water), Autogiros, Ornithopters and Helicopters. The Wakefields and Unlimited designs are of built-up construction. Spans and lengths range up to 4 ft. Structures are similar to towline gliders, light, with numerous wing ribs and fuselage cross-members, High-lift airfoils and large diameter folding propellers are used. The rubber motor of a typical contest type may contain as much as 24 feet of 1,4" flat rubber folded into 12 strands with loops about 2 ft. long. Dethermalizers are employed to limit flight duration as on towline gliders. Rubber motors are "stretch-wound" to pack in the maximum number of turns giving maximum propeller thrust and resulting higher climb. Motors are twisted with the aid of a winder, usually a hand drill with a wire hook in the chuck. Winder is hooked onto prop shaft. Motor is stretched up to four times its normal length and winding beings. As the turns (500 to 1,0(0) mount up the winder is moved toward the model reducing the strain on the rubber. Winder is unhooked from prop shaft, prop is reo leased and model launched. Careful adjustment of flying trim is needed to absorb power of the big prop and still maintain good glide when power is used up. Climb is moderate compared to VTO engine powered free flight, but rubber motor runs longer. Glide is comparable to that of towliners and high altitudes and long flight duration are achieved. Contest flight limits are set at 5 minutes so dethermalizers are used, but duration in excess of 5 minutes is not unusual. HELICOPTER, ORNITHOPTER, AUTOGIRO - Also a part of outdoor rubber flying are the off-beat helicopters, ornithopters and autogiros. There is limited interest in developing and flying these types but they are fascinating in their performance and operation. These types are also flown in indoor competition. Because of the limited interest there are no kits for these odd-balls, magazine plans being the sole source of data for building. The helicopters usually take the form of the familiar Ceiling Walker, but larger. Rubber motor is enclosed in a long slender body with large propeller at each end. One prop is stationary on body while other is turned by the rubber motor. Both body and powered propeller revolve giving a contra-rotation action to the propellers to gain stability. No wings, but short stabilizing fins on body are sometimes used. Flight is straight. up and straight down. The ornithopter (flying wings) is a true aeronautical curiosity since it has no current counterpart in full scale aviation. Lifting power is gained solely by the flapping of the wings like a bird. The rubber motor moves the hinged wing panels by a system of cranks and rods. Models are usually of tractor configuration with a portion of the wing being stationary. Flight is slow and of limited duration, no dethermalizer problems here. The autogiro utilizes one set of free turning rotor blades to gain lift. These are mounted to revolve in a horizontal plane above the fuselage. Forward thrust is gained by a conventional propeller. Tails are in the usual place and short wings are sometimes employed. While a rubber-powered autogiro is a rare bird indeed, there is some interest in their engine-powered counterparts. ROCKET FREE FLIGHT - To date the only safe practical true rocket engines developed for model use are the Jetex units. Originated in England the Jetex reaction engines use solid propellant fuel ignited by a fuse (or wick). The engines are lightweight metal and can be taken apart for cleaning and insertion of fresh fuel charge. The largest Jetex engine "600A," develops 8 to 8.5 ounces of thrust for 30 to 35 seconds. The small "50" delivers .7 to .8 oz. of thrust for 12 to 16 sec. The popular "150" gives 2 to 2-1/2 oz. thrust for 20 to 25 sec. The limited amount of thrust delivered requires a very lightweight model if good performance is to be achieved. Model structures and configuration are typical of those used for towliners and other free flight designs. Rocket free flight contest regulations limit maximum engine size to the "150" and models for this engine usually have about 2 to 3 foot span. 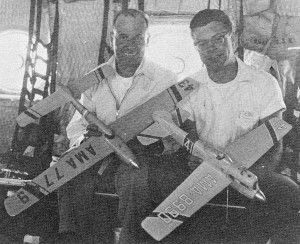 Until recently Pan American Airlines firm sponsored and championed model competition events utilizing the Jetex 50 and 150 engines. The PAA-LOAD contest idea required that a dummy pilot (or cargo) of specified weight be carried aloft. Length of flight duration determines the winner. In addition to the contest models there are also kits available for space rockets, missiles, scale jets and simple sport flyers all designed for the various Jetex rocket units.